Posh player Lee Tomlin challenges Southend's Sam Mantom. Photo: Joe Dent/theposh.com. 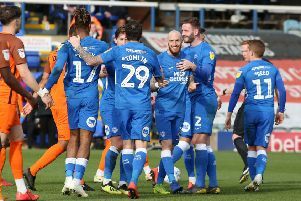 Peterborough United manager Darren Ferguson isn’t getting carried even though today’s (March 23) 2-0 win over Southend United lifted his side back into the play-off places with seven matches to go. Marcus Maddison inspired the win by scoring with a sizzling free kick and by helping create a first Posh goal for on-loan centre-back Ben White with another well struck set-piece. Posh goalkeeper Aaron Chapman was recalled for the visit of Southend. Photo: Joe Dent/theposh.com. 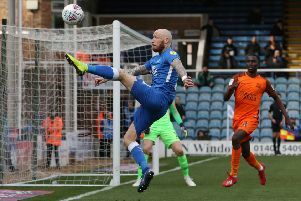 The win ended a run of three straight defeats and with Doncaster getting hammered at leaders Luton and Coventry losing at home to Oxford, Posh clambered back into the top six. It’s likely to be a short stay as Doncaster play Bristol Rovers (March 26) and Walsall (March 30) at home before Posh return to action at home to Gillingham on April 6. Doncaster are a point behind Posh and have a game in hand as well as boasting a superior goal difference. “It’s been a pleasing day,” Ferguson stated. “It was a good team performance and a win we needed, while other results mean we are back in a play-off place, somehow! Posh defender Ben White competes with Simon Cox of Southend. Photo: Joe Dent/theposh.com. “I was pleased for the players today. They have been taking a lot of stick and quite rightly as we haven’t been good enough, but they knuckle down and prepare properly for every game and they deserved the win today. “We had to be patient, but we dominated the first half. There were some glimpses of good football and Maddison’s goal was special. There are not many players in League One who could have pulled it off. “Taking the lead was important and the second goal also came at a good time. We saw the game out very well after that. We defended well and I can’t remember them having a chance. “We played some good football in the attacking third in the first-half. I had to sacrifice things I want like playing out from the back because we’ve been getting edgy when it hasn’t worked for us, but it’s now about getting results and I don’t care how we do that. “Southend are on a bad run, but we could only beat what was in front of us. It will mean nothing though if we don’t beat Gillingham in our next game because we have to put some good results together to have any chance. Ferguson made four changes to his starting line-up including in goal as Aaron Chapman replaced Conor O’Malley. Lee Tomlin was also recalled, while Siriki Dembele returned to action from the substitutes’ bench for the final quarter of the match..
“I’m looking forwared to working with Siriki,” Ferguson said. “He is the type of player who gets bums off seats. His return for the final seven games is massive for us. “I felt it was the right time to get Aaron back in goal. He’s a big character with a big personality and we needed that today. On-loan centre-back Josh Knight should be fit to return for the Gillingham match.